Teams that collaborate are more productive, Slack UK head tells us. Successful businesses typically start small. Usually just one person or a few founders are in control of a company's early days. It’s up to them to nurture the business so that it can expand and, as it does over time, they will add more employees. Those employees will then grow into separate teams that could eventually become separate units. It might take months, years or decades, but eventually this growth of the organisation will add a complexity that can prove difficult to navigate. Making sure that the entire business is moving as one becomes more challenging than when there were only a handful of people involved. Overcoming this challenge is a test faced by almost any business that grows beyond a startup. However, when it comes to large enterprises, made up of tens of thousands of employees, a lack of effective coordination, collaboration and communication can be a genuine threat to success. Every organisation has an interest in ensuring that their employees work and communicate with one another as smoothly as possible - because this impacts their business, their productivity, and their work culture. 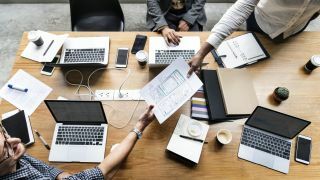 As digitisation and innovative technologies have grown, a new breed of platforms is emerging to help ensure teams are connected in the best ways possible. These collaboration hubs make sure that everyone is in the loop at the right time and can access key information whenever they need it. They are essential in making work happen. It’s not simply about aligning everyone to shared goals (though that is important too!) but it’s also about making the vast amount of knowledge each business owns available to the right people at the right time. To achieve this, organisations should reduce barriers and crack open silos of information - often created by restrictive technologies such as email - to make sure any relevant member of the team can access the knowledge they need to make their project a success. To do this, organisations should focus on moving from legacy platforms to new innovative ones. Channels are a key feature of these new transformative technologies. Each channel is a separate conversation that can be set to be public or private, with members easily added or removed when needed. Dedicated channels - built around individual projects or tasks - foster a team approach driven by transparent sharing of knowledge. On top of this, they work as a knowledge repository - an archive of all existing work - that can be easily searched by members of the team both old and new. By 2025, we think that these channels will replace email as the primary means of business communication. That being said, there is no silver bullet to solving the problem of managing large-scale business communications most effectively. Each company is different and will have its own requirements and its own quirks. For that reason, the collaboration hubs we use need to be flexible, customisable and scalable so that each company and team can create bespoke settings that fit their needs. A company might have 5,500 or 500,000 employees and collaboration hubs need to be able to connect everyone effectively. Today, businesses operate in increasingly complex ways. An effective communication system is essential in making sure employees can navigate the intricacies of modern business and always find the information they need. Collaboration hubs are also key to ensuring that employees support each other with knowledge sharing, remain on track with shared goals and solve problems together. For businesses, this stronger, more effective connection enabled by collaboration hubs will unlock the productivity of teams, no matter their size.